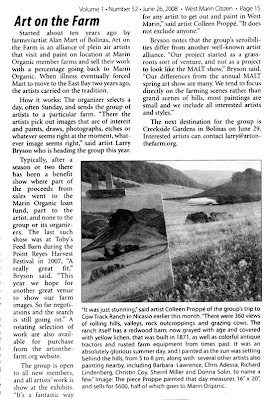 Art on the Farm Weekly... 2008 SHOW! 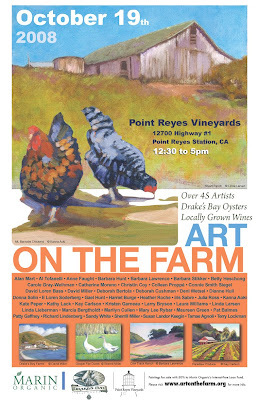 Art on the Farm with Vineyards in Distance, originally uploaded by cproppe. 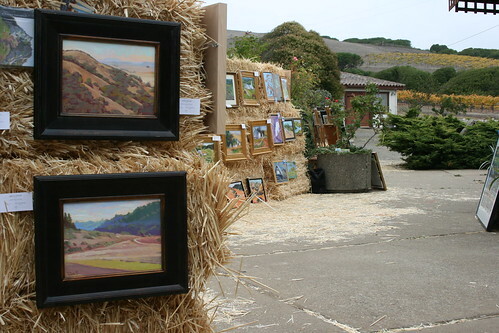 Photos from our group show at the Point Reyes Vineyards today! 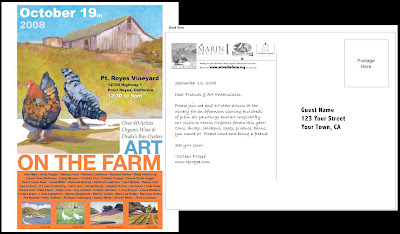 It was a brisk, but exciting day, with excellent wine, art and a beautiful backdrop of autumn colors in the vineyards for our annual, group show of Art on the Farm. The oysters were delicious, and the Doughty's were terrific hosts. Thank you to all the volunteers, and we look forward to the results of the day from Alan Mart. To view more photos from the event, please click here. 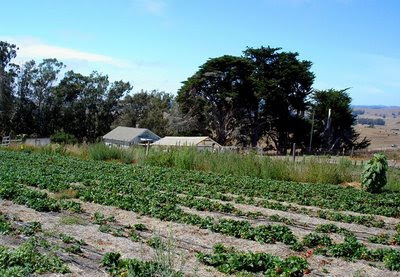 At Fresh Run Farm, owned by Peter Martinelli, beets, kale, collards, and chard grow alongside flowers, strawberries and potatoes on two bowl-shaped plots ringed by wild blackberry bushes. These bushes are heavy with fruit by midsummer and become just another of the many products that Peter purveys. There are also chickens, goats, plenty of dogs and even a few alpacas on the farm. 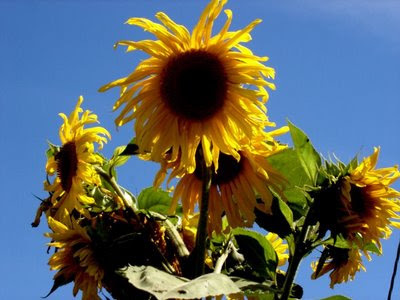 In addition to growing over 40 kinds of fruit, vegetables and flowers, Peter also collects nettles, mushrooms, watercress and other treats from the wild. 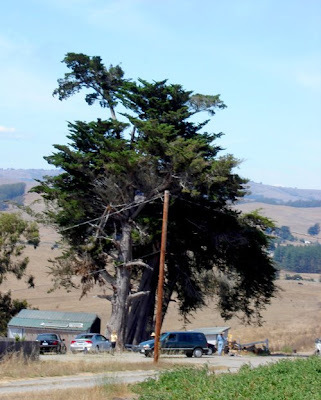 I drove out to Bolinas Sunday morning just in time to catch Peter Martinelli, driving off to a family reunion. 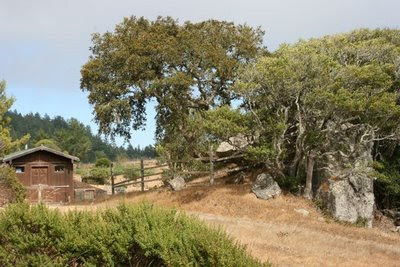 He welcomed the artists to his farm in a secluded spot off Horseshoe Hill Road. I was greeted first by the sheep on the way in, and over the hill was a large field, full of colors of the season. The sunflowers were definitely the most photogenic , but the goats win for friendliest. 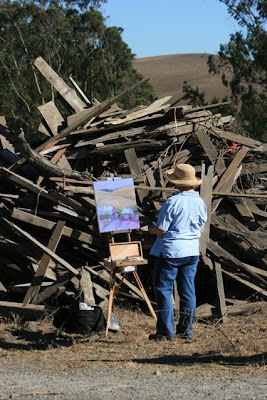 It was a nice day, and I visited with Larry Bryson, this year's Art on the Farm organizer, before several other artists arrived in the afternoon, including Maude from Bolinas, with her well-loved artist chair. Sorry I don't have a photo of that rusty relic, but it was quite charming. 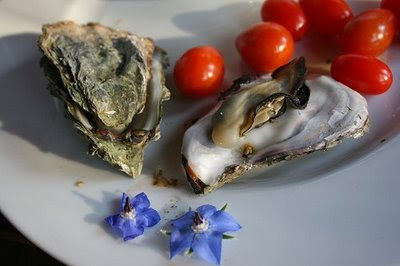 Oysters purchased on Sunday, August 31, 2008, directly from a smiling, blue-eyed, Kevin Lunny of Drake's Bay Oysters, Pt. Reyes, CA. 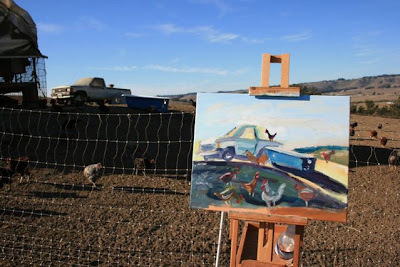 Kevin gave a talk and tour to the "Art on the Farm" group of painters and photographers. I ran into the artists as I was purchasing oysters for a 40th Birthday party at the beach. Kevin is donating oysters to our group show next month. Thank you, Drake's Family Farms! Here are some additional photos of the oysters that were beautiful, and gone all too quickly. and below...a painting, by David Miller, that graces our group poster for next month's art show. 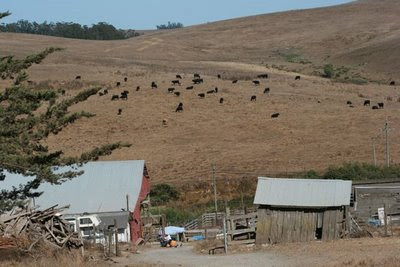 The Art on the Farm group ventured out to Tomales for the day, and were greeted by the most friendly farm animals yet. Clark Summit Farms boasts "twin" dogs, and goats, coming right up to say hello, and some rolling over right away for a belly scratch. There were baby pigs in all different colors. A plethora of chickens were dancing around and jumping on top of a bright blue bathtub at the top of the hill, overlooking the valley. 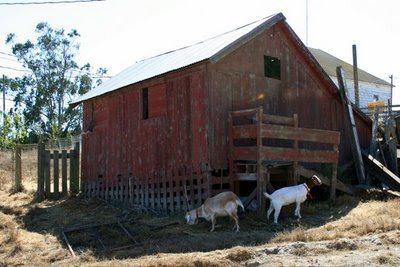 There were many different old barns of all different shapes and sizes. The painters settled right in and the animals roamed around us, often coming over to check on our work. 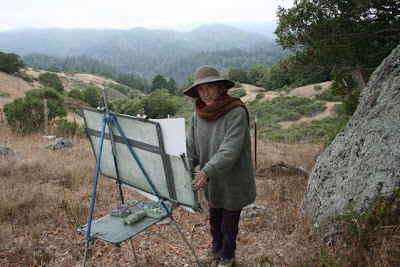 I met a new artist this week, Dianne Hull (pictured below), and she had a very nice painting in progress by the time the wind drove me down the hill. 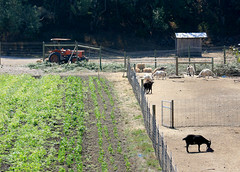 I am including some photos of the artists and farm residents at work, and many of the great animals at Clark Summit. To view more of my favorite shots from this outing, click here. 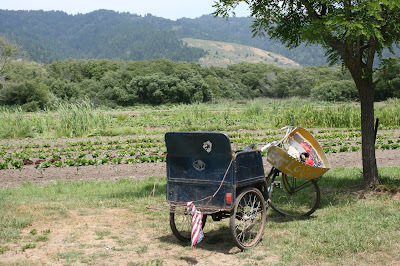 ripe tomatoes , bolting lettuce and wonderful strawberry rows. I realized the weather was not going to last. 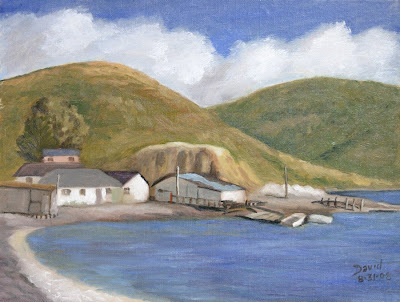 I chose to paint one of the many building sites with some of the wonderful big trees sheltering them." 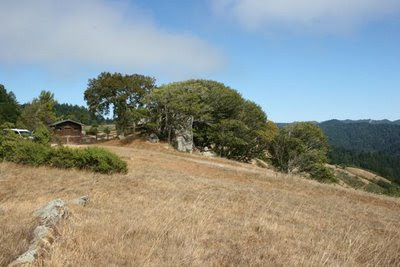 Set way back beyond in the nether regions of West Marin, even beyond hidden Bolinas, is Regenerative Design Institute. What a fantastic place! I got lost and was a bit frantic, but once I parked and unlatched the wooden gate, I found a 17 acre site full of quiet and wonderful growing things. Overlooking the gorgeous field of vegetables are two cob-built (straw and clay) houses for workers, each with beautiful insets above the entry made from green glass wine bottles. 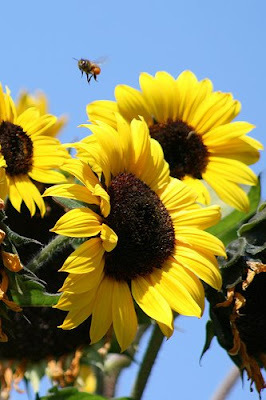 Bees buzzed, taking in pollen from all the wild flowers and bringing it back to their hive sandwiched between two cookie sheets on an outdoor picnic table. The smell of honey was wonderful! 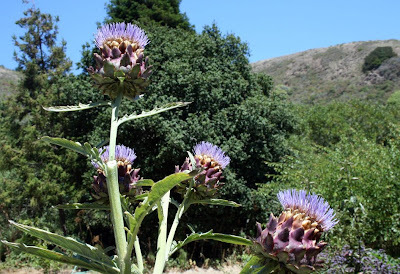 While roaming the grounds, I fell in love with the beautiful purple blossoms of the artichokes. These plants were sprouting here and there, giving the gardens a sweet highlight of color. 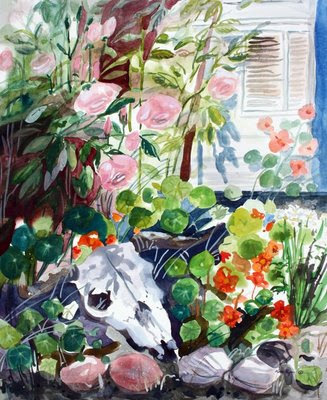 I wound up by a little greenhouse where some luscious pink roses were drooping their pink blooms and the nasturtiums sprawled around a cow's skull. While I was painting, little red plums were falling around me like rain! A worker quietly gathered them as best she could in a bowl, saying they're falling faster than she can collect. 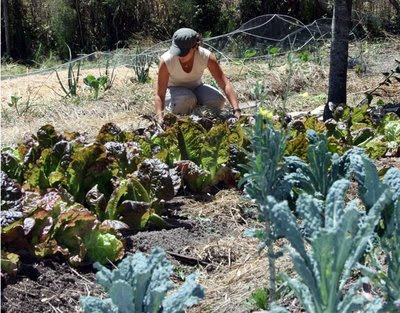 "(a) farm ... being transformed into a permaculture model of human beings living in harmony with the earth." Grey water use, classes involving kids and community, organic gardens featuring all kinds of vegetables and fruit--it was exciting to be there but also very relaxed and carefree, at least for the painter visiting for a day! It's a ways out there, but well worth the drive. 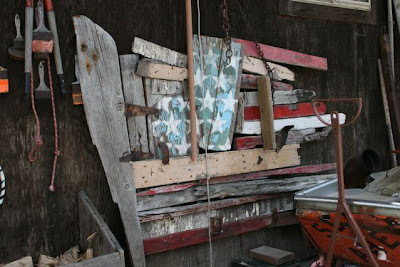 Flag art located on Gospel Flat Farm, Bolinas, CA. 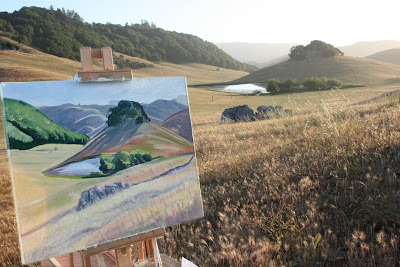 Artists had the joy of painting in afternoon light this Memorial Day weekend on this unusual farm in Bolinas, CA. One building had and entire whale skeleton on the roof; apparently all bones that had washed up on the shore in Bolinas that had been each collected over time and left on the roof to dry. A duck house, made of an old windsurfer, buoys and odd recycled goods, glided back and forth on a duck pond, with an island inhabited by rabbits in the center. Under the arched bridge to the island, 4 ducks paddled and swam in the green and blue hues. 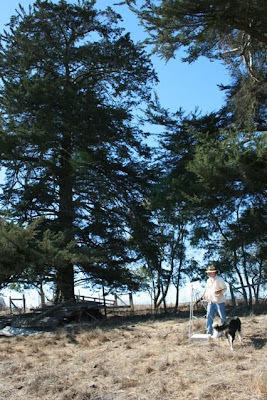 Bolinas Ridge in the distance, and artists painting for hours, quietly engrossed in their work. Lettuce and chard rows were plentiful, and a friendly girl name Anna Rose, who sat down to read a book in the lettuce rows, explained they have no problems with deer or rabbits eating the food. An old rickshaw style bike with a large, metal basket painting, "Eat Local" seemed like a throw back to another time, when life was this simple and peaceful. 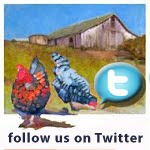 For more information on Gospel Flat Farm, please visit their new website. If you can't see a gallery of images above, please upgrade your browser. Pictobrowser does not work with some older browsers. Still can't see the photos? 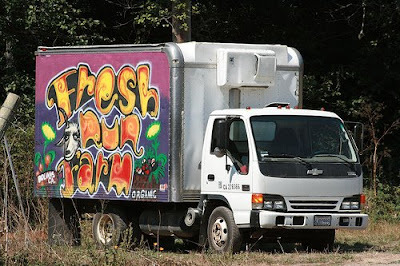 Click here to view "Fairfax Fresh Set" on Flickr. Can't see the photos? Click here to view "Paradise Valley Set" on Flickr. Can't see the photos? 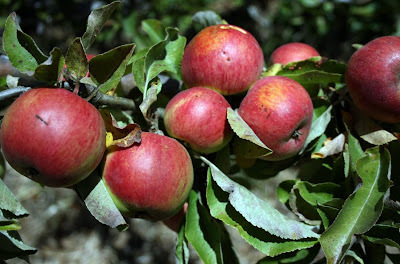 Click here to view "Red Hill Farms Set" on Flickr. Can't see the photos? Click here to view "Carbon Farm Set" on Flickr. This gallery includes a small sample of images from 2007. To view or purchase 2008 images, please visit the Art on the Farm website, maintained by Larry Bryson. 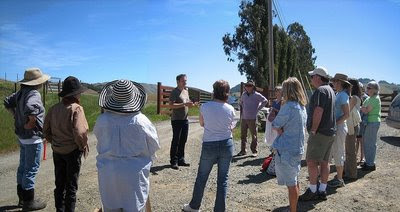 Helge Hellberg, of Marin Organic, speaks to artists on Carbon Farm, in Nicasio, Spring 2008.